Ever wanted to drill a square-hole? Is it possible to build a drillbit that would produce such a shape? It seems impossible, but how impossible is it? Can we drill holes that are any shape other than circular? A circle is a curve of constant width. As you rotate a circle its width doesn't change. Does any other shape have this property? Why yes! The Reuleaux polygons all do. The simplest and best known of which is the Reuleaux Triangle. How do you draw a Reuleaux triangle? Draw an equilateral triangle, and then inscribe 3 arcs, each centred on a point of the triangle and travelling between the other two points. What can you do with this special shape? 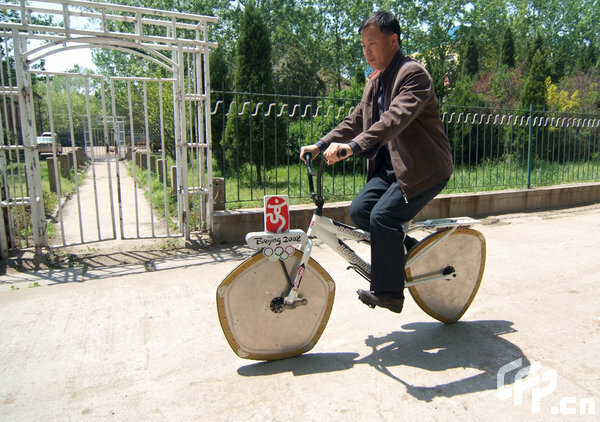 You can make a bike that has non-circular wheels but still gives a smooth ride. The four-stroke cycle occurs in a moving combustion chamber between the inside of an oval-like epitrochoid-shaped housing, and a rotor that is similar in shape to a Reuleaux triangle with sides that are somewhat flatter. Here's a program for drawing multiple triangles. Can you write a program that draws a Reuleaux polygon of any number of sides? Hint: here's a program that works only for odd-numbers of sides.